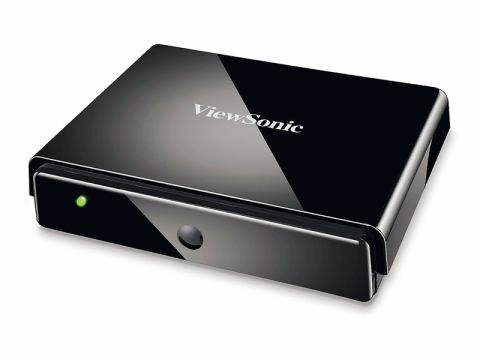 The VMP74 is the flagship model in Viewsonic's range of media players, boasting an array of internet-enabled bonus features including YouTube, web browsing, radio, RSS feeds and, soon, BBC iPlayer. It has no built-in storage so you'll need to insert your own flash sticks or portable drives to either its USB or eSATA ports. Or you can stream files from networked storage devices (a PC or NAS drive) using the uPnP or DLNA method or the freeware Samba server software. Viewsonic has not seen fit to include built-in Wi-Fi so a dongle is required. The all-black casing has nothing visual up front except a single LED power indicator. Joining the data ports on the rear are an HDMI, combined composite video/stereo phono output and an optical digital audio output with Dolby and DTS passthrough. The shiny plastic remote looks more like a TV zapper and bristles with buttons – many of them the same size and colour, which is initally intimidating. A scrolling row of icons akin to a more basic version of Sony's Xross Media Bar makes up the Home Menu. The VMP74 automatically detected Windows and Twonky servers on our PC running Windows Vista as well as our Western Digital MyBookWorld II NAS drive. It played all the file formats we tried, though HD files took a while to start playing (we used a Netgear wireless N router connected via Ethernet). You can playlist files but video fast-forwarding/rewinding speed tops out at only 16x. You can use the remote and a virtual keyboard, but using the online features works best with a mouse and keyboard (wireless devices are supported). You can bookmark sites (Google is included) but it's disappointing to find the YouTube link doesn't take you to the simplified TV-friendly version. If web-browsing or iPlayer are definitely on your wish-list the VMP74 is one of the better media players available.